It was an unprecedented outbreak; it never happened before. There were a lot of things we didn’t know at that time. No one could have imagined that it would be what we have now. In the spring of 1991, as tensions escalated between rebel factions and the ruling government of the fictional country of Changa, 200,000 refugees fled to neighboring countries where they faced starvation and disease. Hundreds of US Peace Corps volunteers, Christian aid workers, and American military personnel were working in refugee camps to provide medical care and improve hygiene. In this context, a novel and terrifying disease appeared: at least two-dozen refugees had died of a mysterious ailment, with symptoms that included headaches, vomiting, rash, and gastrointestinal bleeding. Several US members of an international peacekeeping force were stricken with the disease and returned to Fort Bragg. Two of these soldiers then died of liver failure. An army colonel classified the situation as a “global epidemiological emergency”. The State Department reported that several civilian volunteers had died after returning to the US on commercial flights, on which they encountered “thousands of people who they might have exposed to the disease.” A number of medical volunteers fell ill in the field, and anxiety was growing among civilian health workers. The U.S. military also lacked expertise and equipment to deal with the situation: “We have insufficient expert manpower to sustain appropriate levels of health care, and inadequate supplies,” reported an Army General. Nor could international organizations augment American resources: “At all times the infectious disease unit at WHO is running on a shoestring,” said an international health official. As the exercise continued, the disease spread unchecked as infected civilian aid workers and military peacekeepers fled the zone and brought the disease back to their home countries. The “Super Ebola” exercise stimulated reflection among the international health experts on the problem of emerging disease, and pointed them toward a diagnosis: we are not prepared. “You never think such a thing could happen, and then it does,” commented CDC physician Louisa Campbell. “And you’re caught totally unprepared” (Garrett 1990). William Reeves, an expert on insect-borne disease control from UC Berkeley, noted that the lessons of the exercise were not limited to Ebola: “You could take any disease as a model – Ebola, malaria, whatever – and it would reveal the same thing. We aren’t ready. Where are the people? The expertise? The equipment? Some planning needs to be done on this” (ibid.). 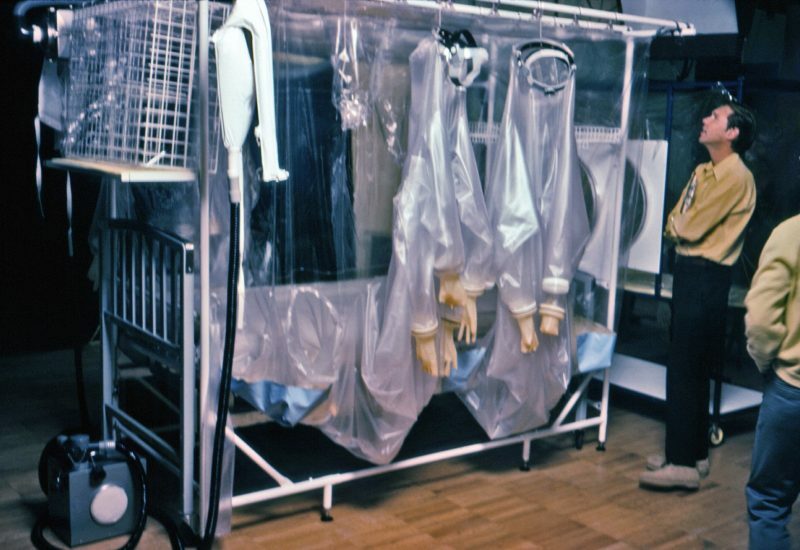 A Bed Isolator produced by Vickers Medical Ltd. on display in 1977 at the CDC. 1976. In the seminal 1993 volume Emerging Viruses, Legters and two colleagues published what they called a “News Report of the Future,” which included a fictional Special Report by an interagency working group on the lessons learned from the “Super-Ebola” pandemic. “To put it succinctly,” summarized Legters, “the outbreak has confirmed, in a very dramatic way, just how ill-prepared we are to detect global epidemic disease threats in a timely fashion, and, once detected, to respond appropriately” (Legters et. al. 1993: 277). This lack of preparedness was especially alarming, he argued, since the world could expect an increasing number of epidemic emergencies due to a number of factors: growth in human population, overcrowded cities, human intrusions into previously uninhabited areas, civil wars leading to crowded refugee camps, and commercial travel that could rapidly spread diseases around the world. Today, more than two decades later, Legters’ diagnosis may seem self-evident and unremarkable. However, it is worth underscoring its novelty at the time. 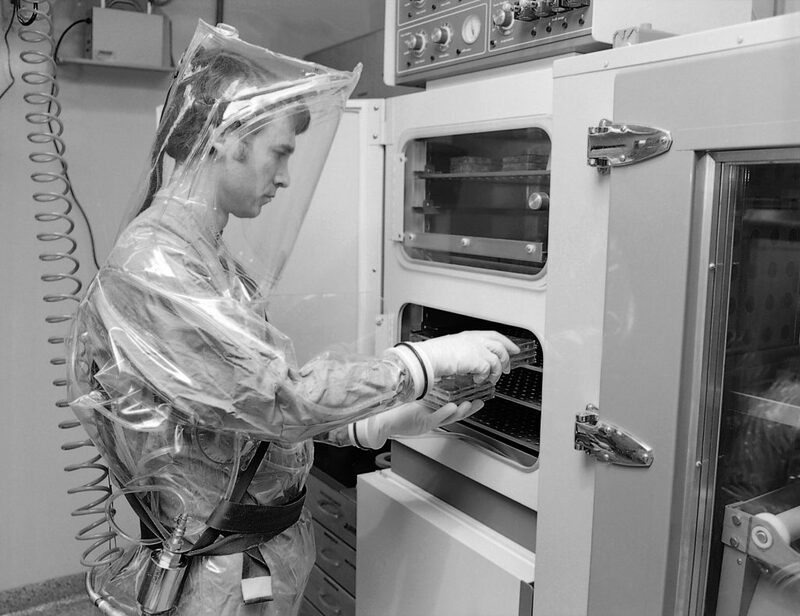 The expectation that international health authorities should be in a state of ongoing preparedness for the emergence of a novel pathogen was just being established in the 1980s. Indeed, exercises like the 1989 Super-Ebola simulation were among the events that helped to establish preparedness as a central problem and norm for global health. 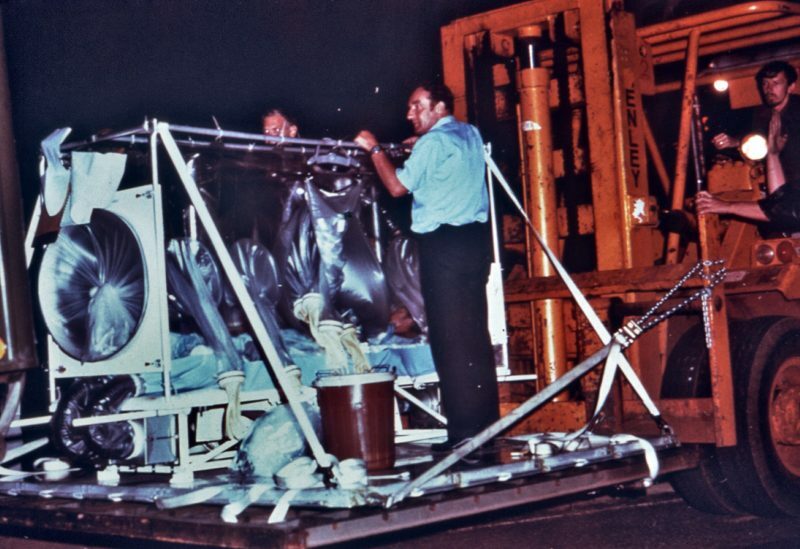 A suspected Ebola patient being moved from a plane in Pretoria, South Africa during the Zaire outbreak of 1976. Reprinted in Garrett 1990. To address the problem of preparedness, Legters proposed the development of a global infrastructure for detecting and managing future outbreaks. Such an infrastructure would include “a surveillance system that can identify unusual disease occurrences near their point of origin; a laboratory system that can quickly characterize the causative agents; a reporting system that alerts the world health community; and a way to institute controls” (Legters, et. al. 1993: 279). Among these elements, Legters focused in particular on the need for a global disease surveillance network, endorsing a proposal made by D.A. Henderson, who had led the WHO smallpox eradication campaign, for epidemiological research centers around the world that could serve as “‘listening posts’ to identify epidemiological events that might signal global epidemic disease threats” (Legters et. al. 1993: 280). At this time, in the early 1990s, a range of advocates for the “emerging diseases worldview” (King 2002) proposed similar preparedness measures. And over the next several years, many of these proposals were implemented in some fashion. A global outbreak alert and response network was set up; tools and capacities for the laboratory identification of emerging diseases were built in a number of regional centers; incentives to address the lack of biomedical counter-measures to manage novel disease threats were developed; and a framework for governing global emergency health response was established. In some sense, then, the scenario of a severe Ebola epidemic provided both a motivation and a model for assembling the contemporary infrastructure of “global health security” (Collier and Lakoff 2008). What, then, are we to make of CDC epidemiologist Pierre Rollin’s claim—cited in the epigraph to this introduction—that “no one could have imagined” the Ebola epidemic of 2014? What, precisely, was unimaginable about the event? As we have seen, it is not that global health authorities had never contemplated an Ebola epidemic of this scale or severity. A much broader epidemic, involving a much more dangerous strain of Ebola, had been explicitly imagined by international health experts twenty-five years earlier. Nor was it the prospect that an Ebola outbreak might prove especially difficult to manage in a conflict or post-conflict situation. Nor, finally, was it the difficulty encountered in mobilizing trained personnel, deploying mobile infectious disease treatment units, or coordinating response through a World Health Organization that had been reduced by budget cuts. Legters and others had anticipated all of this. Indeed, these considerations provided the rationale for early proposals to create a global health preparedness infrastructure. Rather, it seems, what was surprising to experts like Rollin in 2014 was that “normal” Ebola—and not a strain of “super-Ebola” or some other novel pathogen—could produce such a widespread epidemic given that all prior outbreaks had been limited to small geographical areas and to relatively low numbers of cases (see Lakoff, this issue). According to the 1989 scenario, the catastrophic outcome was a result of the exceptional characteristics of the pathogen itself—its virulence and transmissibility. Given this focus on pathogenicity, setting up an apparatus of preparedness that focused narrowly on disease identification and monitoring seemed to be an adequate response. In 2014, however, it turned out that the severity of the epidemic was due to factors that had not been contemplated by the designers of the “Super-Ebola” exercise—factors that were not addressed by the minimalist infrastructure of global health security that was designed and built in its wake. Among these were: the absence of basic health infrastructure in much of the region, making it difficult to isolate patients and trace contacts; limited capacities of humanitarian NGOs to manage the spread of the disease on their own; and health authorities’ inability to enroll a skeptical public in disease prevention efforts and in case reporting. So what are we to make of this? What can we learn about the contemporary field of global health—and its limits—from the still-unfolding epidemic? The existing infrastructure of global health preparedness, as we have seen, focused narrowly on the rapid detection and containment of a novel pathogen. The events of 2014, by contrast, seem to indicate the need for a more expansive vision of preparedness—one that would break down existing institutional boundaries and divisions of labor: between international health organizations and national governments; between humanitarian medical response, state-based public health, and private sector drug development; and between the routine practices of public health and the acute management of health emergencies. This issue of Limn, on the ecologies of Ebola 2014, examines how the epidemic has put the norms, practices, and institutional logics of contemporary global health into question, and looks at the new assemblages that are being forged in its wake. The concept of “disease ecology” typically refers to a pathogen’s relationship to a natural milieu—particularly animal hosts and their environmental niche—and to how this milieu is affected by human behavior. Here, however, we conceive of Ebola’s ecologies more broadly to include the administrative, technical, political, and social relationships through which disease outbreaks evolve, and into which experts and officials are now trying to intervene in anticipation of future outbreaks. Our discussion of the super-Ebola scenario above points to one such ecological relation: that between the pathogen and the apparatus of global health security. From this perspective, the surprising severity of the 2014 outbreak can be explained in part by the limitations of the health preparedness infrastructure that was built as a result of scenarios like the 1989 Super-Ebola pandemic. The current epidemic has also drawn attention to other critical elements of Ebola’s changing ecology, including medical humanitarianism, drug development, and risk communication (see the essays by Redfield, Nading, and King, respectively). The contributors to this issue draw on long-term research in these various domains both to understand the “event” of Ebola 2014 and to place it in a broader perspective, addressing questions such as: what has been revealed about the ambitions and the limitations of humanitarian medical response? What are we learning about the assumptions that undergird the contemporary organization of global health security? Are new models of biotechnical innovation being established in the midst of the crisis? Collectively, the essays suggest a distinctive critical vantage in a field that is saturated with observers. Policy makers, officials, health experts and other critical commentators have rushed to diagnose failure, assign responsibility, and propose ameliorative measures. In contrast, the contributors to “Ebola’s Ecologies” take a step back from such assessments to examine how, amid the Ebola 2014 epidemic, the very terrain of global health may be undergoing transformation. For example, many critics have placed blame for the lack of available medical counter-measures against Ebola on the profit-orientation of the multinational pharmaceutical industry. Closer examination, however, points to a more complicated story about how research and development priorities are established not only in the global drug industry, but also in philanthropic ventures to deal with “neglected” diseases and national biodefense initiatives targeted at “select agents” (see Nading). Moreover, the emergency has sparked attempts to shape novel platforms of experimentation that can bridge regulatory demands, humanitarian imperatives, and industry expectations (see Kelly). Meanwhile, some critics have argued that an over-emphasis on pandemic preparedness drew attention away from necessary investment in public health infrastructure in poor countries. But Fearnley counters that this opposition may be overdrawn: the epidemic demonstrates that classical public health and health preparedness are necessarily complementary. Moreover, he argues, the Ebola epidemic shows that preparedness is of vital concern to rich and poor countries alike. These and other contributions to this issue suggest the need to shift our critical gaze: from an exclusive concern with diagnosing failure, to the analysis of how Ebola 2014 has made visible the limitations of existing norms, institutions and practices, as well as the possibilities for a new politics of global health. This description is abridged from (Garrett 1990). See also Garrett (2004). Collier, Stephen J. and Andrew Lakoff. 2008. “The Problem of Securing Health,” in Lakoff and Collier, eds., Biosecurity Interventions: Global Health and Security in Question. New York: Columbia University Press. Garrett, Laurie. 1990. 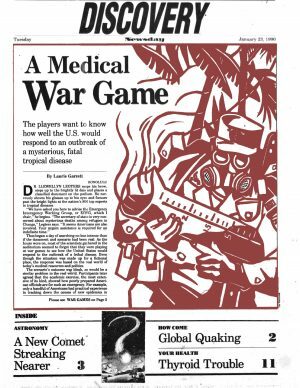 “A Medical War Game.” Newsday. Jan 23rd. Garrett, Laurie. 1994. The Coming Plague: Newly Emerging Diseases in a World Out of Balance. New York: Farrar, Strauss, Giroux. King, Nicholas. 2002. “Security, Disease, Commerce: Ideologies of Postcolonial Global Health. Social Studies of Science 32(5-6):763 – 789. Sack, Kevin, Sheri Fink, Pam Belluck and Adam Nossiter. 2014. “How Ebola Roared Back.” New York Times, December 29th.